As you know my blog centres around my eczema and allergies. I am lucky to have opportunities to test products but sometimes I have to turn them down because beauty products can contain my food allergens. For the first time ever I was questioned by a Company offering me a product containing one of my allergens. It may seem odd to refuse to test a hair styling product. However, I have to consider the percentage of product that I can absorb via my skin and if it could come in contact with my mouth (transference from hands if not washed immediately after use). 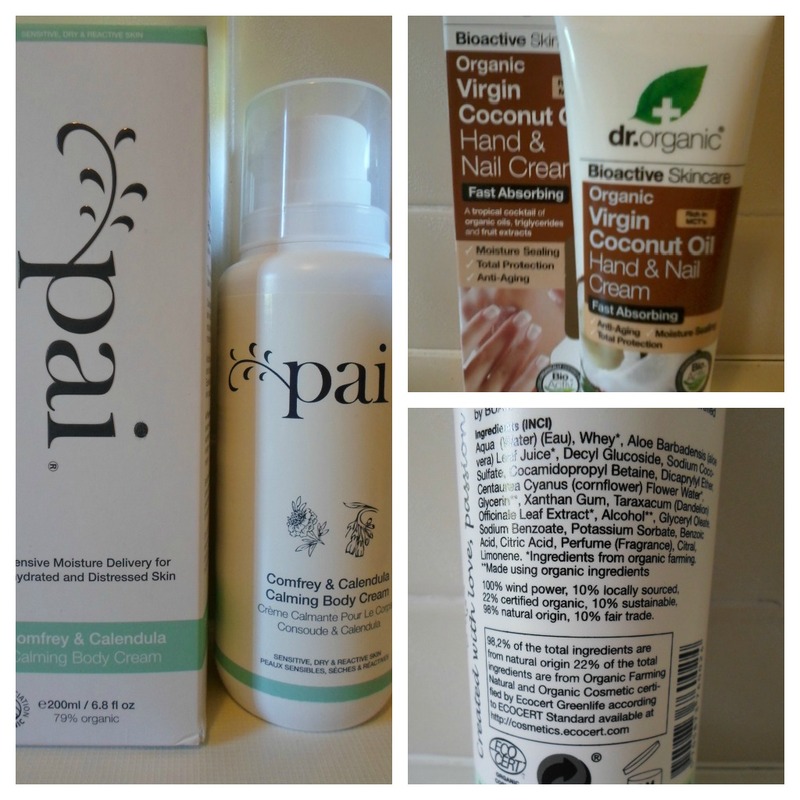 Pai Body Cream and Dr Organic Coconut range are off limits for me because they contain orange. If I consume oranges (or their relations like tangerine or mandarin) I get a rash and asthma. Let me tell you that for many years I suffered an itchy scalp even after switching to SLS free shampoo. When I was at my wits end I read the ingredients over and over again and the common factor between brands I had tried was orange. Once I switch to brands free from orange my scalp has rarely itched. It could be pure coincidence but it may not. Most recently I have started to break out with eczema across my shoulders. For many years I have washed my hair over the bath as this limits the contact with eczema on my body. Out of laziness (and a sore back) I went back to washing it in the shower. I have been using Unique Nature Green Moisture Shampoo since September. When I blogged about it Dairy Free Baby & Me pointed out it contains Whey. Could the sudden outbreak of eczema be a reaction to this ingredient? Is it a coincidence? Could I build up a reaction over time? It’s certainly food for thought (pun intended!). When I had my skin prick test at 10 years old I have no idea whether any one said to my Parents I was to avoid my allergens in skin care. My Mum will tell you how sore my skin was when it came in contact with certain skin care but she wouldn't have checked ingredients. It's certainly something I have taken upon myself to do in recent years. It is just as important to me as avoiding as many synthetic ingredients as possible. Of course I am basing this on personal experience. I find it interesting that some natural brands promote being allergen free (Sophyto is Gluten free & Premae is free from 8 common allergens). If you are suffering from sensitivities and have food allergies it may be worth thinking outside the box and looking at the food ingredients you are putting onto your skin. I would love to hear from others in the same position as me. I am fortunate to not have anaphylaxis as I imagine if you are then avoiding food allergens in your beauty routine is necessary. But for everyone else with milder reactions or intolerance, are you avoiding food allergens in skincare? Have you noticed reactions via your skin? Do you worry about products coming in contact with your mouth? (e.g. lip balms or face creams). A great post which really did make me think, it must be difficult for people with allergies to find suitable products that will not cause harm. My neice has a nut allergy so has to be very cautious regarding cosmetics. I'm lucky not to have a nut allergy, how I managed to get away with that I will never know lol. It must be difficult for people like your niece, nuts seem to be every where. It doesn't surprise me that you might react topically to food allergens, as so much of what we put on our skin is absorbed! I know there has been research done recently on gluten intolerance and gluten in personal care products. Anyway - really pleased to see this issue raised! I've been reading your article about fragrance allergens. It's a very interesting subject. I think better labeling has to be a good thing and I would be comfortable with either format you have suggested. I assume only the most common would be accounted for otherwise it would be a never ending list. The other day I rejected a hair product as it contained mushrooms which is another one of my allergies. I know you have to list ingredients by INCI but not everyone puts the English versions alongside. That's when my world gets a bit complicated. I find it difficult to remember which is which when faced with Citrus Paradisi, Citrus Aurantium Dulcis and Citrus Medica Limonum (grapefruit, orange & lemon). Has anyone looked at Milk in skincare? I naturally avoid products like Burt Bees Milk & Honey body cream or the Australian brand Moo Goo. Interesting that is not something I have heard of before not being able to go to hairdressers? What I am hearing always relates to Gluten but I want to raise awareness that there are other food allergies in personal care. My son has multiple food allergies. When our household started to switch to cleansers and toiletries with natural ingredients, I noticed that some products do contain ingredients such as wheat germ, soy, milk, nuts etc. I talked to his Allergist and he did warned me to test any product on a small portion of his skin first for at least 24 hours before using it. He said he learned it the hard way when they were on vacation and used a new sunscreen without reading the label to his daughter who eventually had a major allergic reaction. It's very interesting to hear that others do have to consider food allergens in personal care products.